With this new version of Yahoo! 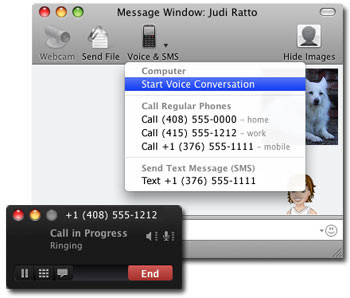 Messenger for Mac Beta, you can make free PC-to-PC calls or sign up for a Phone Out account to make calls from your Mac to regular or mobile phones worldwide for as low as 1¢ a minute (see rates). And if you want friends to be able to call you on your Mac from any phone, you can sign up for a Phone In account and choose a number. Users can also enjoy two other handy features: free voicemail and call forwarding. If you're away from your Mac or signed out of Yahoo! Messenger, friends can leave you a voicemail which is then delivered as an email attachment to an address of your choice. If you want to make sure you don't miss any calls, use the call forwarding feature to immediately send incoming calls to any regular or mobile phone number.